We here at Fotobabble love music and love the Bay Area. The music scenes of New York and LA get lots of attention, but, hey, we got talent, too! 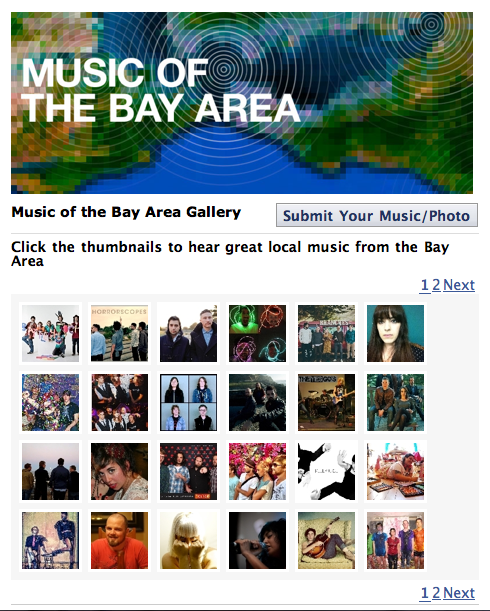 This summer, we’re featuring a Music of the Bay Area showcase on Facebook and with bands and artists from the Bay Area. The showcase includes an official band photo, music sample, and a link to where the band’s music can be purchased. “Talking Photos” are the perfect vehicle for bands to get their music out. Everybody knows posting photos is the best way to increase response rates on Facebook – some have even reported a 100% increase in response rate when posting with a photo versus posting without. Combining an eye-catching photo with your music is the smartest way to reach your current and future fans on Facebook. In addition, sharing and spreading your music is a piece of cake. With only a few clicks, you can share your Talking Photo on your own Facebook wall, share on a Fan Page wall, share by email or grab code to embed your photo in a blog or website. The Music of the Bay Area showcase is filling up quickly with artists ranging from electro-hop to alt-country music, but it’s not too late for your band to promote itself. If you’re a Bay Area performing artist please contact noelle@fotobabble.com if you’d like to be featured. In the meantime, see and hear some of the Bay’s local favorites here.